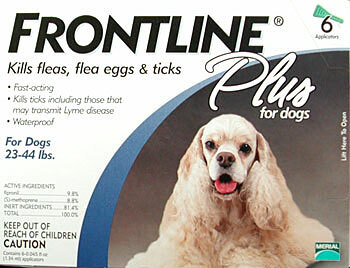 Frontline Plus® - Available in 3 & 6 packs - All the protection Frontline gives plus added protection to kill ticks, fleas, flea eggs, and flea larve. Each treatment controls fleas for up to 3 months and ticks for up to 1 month. To ensure proper flea and tick control and minimize risk of infestation, continuous year-round treatment is recommended; even in winter months. This product is made in the USA and is FDA & EPA approved. Frontline Plus® is a quick and effective tick and flea control for your pets that completely kills and eliminates fleas and ticks within 24 to 48 hours. The ingredient (S) methopene in Frontline Plus® also stops the early stages of these common pet parasites by killing the eggs and larvae. This makes Frontline Plus® the most complete protection for your dog.